This area is for writing your GenoCon2 Report. The guidelines below are for writing a 6 section report. An image should also be included. The followings are basic explanation about key parts for Challenge B sample program. Load the data of 5 tables (dna, promoter, protein, signal_peptide, terminator) included in the sample data (http://linkdata.org/work/rdf1s222i). In this part, create a function to get sequences; We named this function as ‘getSequence’. You can change the function name. In this part, create a function to reverse translate; We named this function as ‘reverse Translation’. You can change the function name. Select protein sequences registered in sample data, execute reverse translation by using the function you created in Part C, obtain DNA sequences, outputs of the execution, and display the DNA sequence in the result area. More detail is explained in the below. In this part, amino acids are linked to codons. *This example is not the best. You may brash up this "map" function considering with codon optimizations to Arabidopsis and/or other idea. *DNA sequences are represented by a letter string such as `ATGC` whereas protein sequences are represented by a letter string such as `MFLIV...`. Store protein sequences in a variable named “hpsSeq”. Translate the protein sequence stored in the variable named "hpsSeq" to a DNA sequence, by using the function created in ③, and store the DNA sequence in variable named "hpsDnaSeq". Concatenate two DNA sequences “hpsDnaSeq” (reverse translated in ④-2) and “phiDnaSeq” (reverse translated in ④-4), and store the DNA sequence in variable named “dnaSeq”. Display the DNA sequence “dnaSeq” in the program executing area. HTML tags are embedded in the result display area. 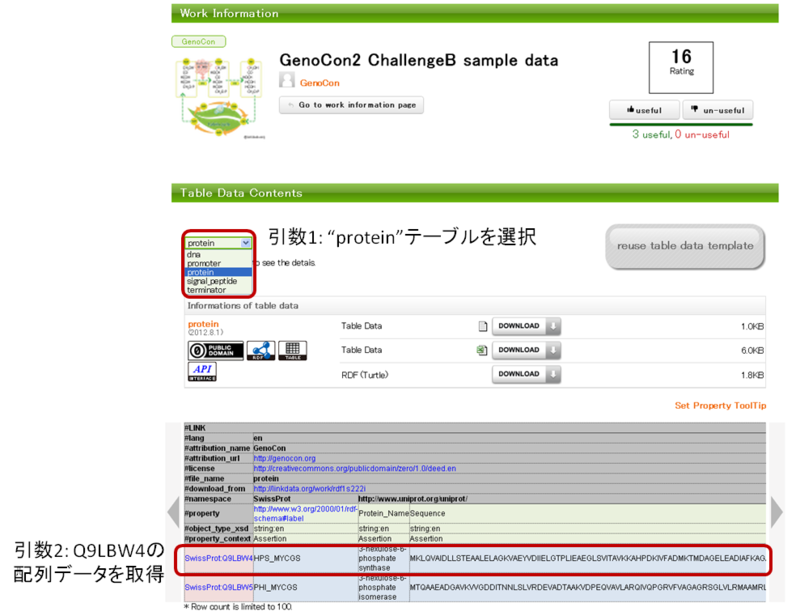 By appending the strings of DNA sequence into the tag, the design results are displayed. 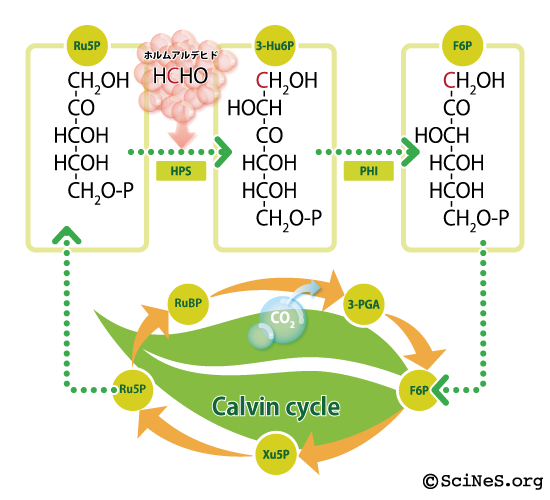 The plant should get the function to eliminate formaldehyde by inserting two enzymes, HPS (3-hexulose-6-phosphate synthase) and PHI (6-phospho-3-hexuloisomerase) into the Calvin Cycle of the plant. L. M. Chen, H. Yurimoto, K. Z. Li, I. Orita, M. Akita, N. Kato, Y.Sakai, and K. Izui. 2010. "Assimilation of formaldehyde in transgenic plants due to the introduction of the bacterial ribulose monophosphate pathway genes." Biosci. Biotechnol. Biochem., 2010. 74:627-635. Mitsui R, Sakai Y, Yasueda H, Kato N. 2000. "A novel operon encoding formaldehyde fixation: the ribulose monophosphate pathway in the gram-positive facultative methylotrophic bacterium Mycobacterium gastri MB19." J Bacteriol.. 182:944-948.
insert work id or work name.